Influenza Virus are remarkable because of the frequent antigenic change that occurs in HA (hemagglutinin) or NA (neuraminidase). 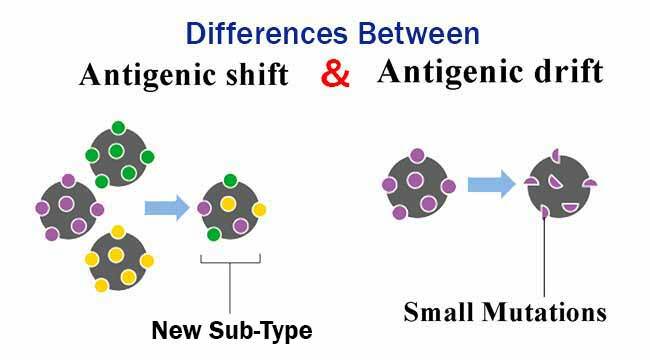 The two surface antigens of influenza undergo antigenic variation independent of each other. They are Antigenic Shift and Antigenic Drift. 7 Occurs as a results of genome reassortment between difference subtypes. Occurs as a result of the accumulation of point mutations in the gene. 8 An antigenic change which results in drastic or dramatic alternation in HA (hemagglutinin) or NA (neuraminidase) subtypes. An antigenic change can alter antigenic sites on the molecule such that a virion can escape recognition by the host’s immune system. 12 Give rise to pandemics, which occurs irregularly and unpredictably. Usually responsible for epidemics in between pandemics. 13 Example: The 1968 pandemic arose when the H3 hemagglutinin gene and one other internal gene from an avian donor reassorted with the N2 neuraminidase and five other genes from the H2N2 human strain that had been in circulation. Example: The 1918 pandemic arose when an avian H1N1 strain mutated to enable its rapid and efficient transfer from human-to-human. Example: The subtle mutations accumulated through antigenic drift of these subtypes (e.g., H1N1, H3N2, H5N1) give rise to different strains of each subtype. Example: Antigenic drift is also known to occur in HIV (human immunodeficiency virus), which causes AIDS, and in certain rhinoviruses, which cause common colds in humans. It also has been suspected to occur in some cancer-causing viruses in humans. I am Completed Degree Microbiology Planing to work and continuted study master’s .if u possible can u help me microbiology basic techniques for laboratory work.if u help me anything notes send my through mail id..